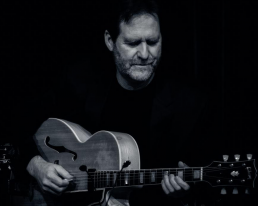 Currently one of the Pacific Northwest’s busiest guitarist Tim plays regularly with Lee Oskar and Friends, The John Stowell Tim Lerch Duo, Danny Vernon and the DeVilles, The Mark Dufresne Blues Band, The Hitmen and The Edsels, The Sandy Carbary Tim Lerch Duo and the Tim Lerch Trio. Also a sought after session guitarist, Tim records frequently in Seattle and Vancouver. In addition to his playing schedule Tim is also a well respected and popular teacher with a busy schedule of private lessons, classes and workshops. For those players who don’t live near Seattle Tim is now offering private online lessons. Tim has had the very good fortune to study with Ted Greene, Joe Diorio, Lenny Breau, Joe Pass, Jimmy Wyble and Ron Eschete’. Harmonica Virtuoso and founding member of the band War Lee Oskar, Former Roomfull Of Blues frontman Mark Dufresne, John Stowell, The Diamonds, Little Anthony, The Platters, The Coasters, The Drifters, Chuck Berry, Dell Shannon, Brenda Lee, Richie Havens, Duke Robillard, John Popper, Roger Fisher, Ron Eschete, Robbie Buchanan, Michael Creber, Ken Filiano, Ravi Coltrane, Gary Marshall (Kenny Rankin), Sheldon Gomberg (Rickie Lee Jones), Allan Dysart (The Young and The Restless), Julie Wolf (Ani DeFranco) Bruce Day (Pablo Cruise) Marty Jourard (The Motels), Dan Tyack (Asleep at the Wheel), Bounce The Ocean (Private Music recording artists), Ben Smith (Heart).